Cake Mix Coffee Cake is an easy, quick coffee cake to make. 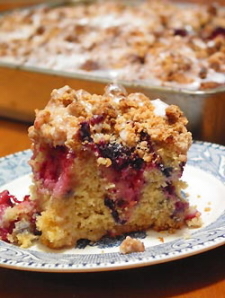 With this versatile recipe, you can make a different breakfast coffee cake every weekend. Cake mixes are great for occasions when you are short on time or ingredients. With just a few extra ingredients, you can make a quick coffee cake in minutes. You can use white cake mix, yellow cake mix, lemon cake mix, butter cake mix or any flavor you like. With this recipe, you can use any fruit canned pie filling you like. Apple pie filling, cherry pie filling, blueberry pie filling, peach pie filling and apricot pie filling are just a few of the many choices available today. You can even combine two different fruit canned pie fillings. This moist quick coffee cake is even better with a powdered sugar glaze. 1. Preheat oven to 350 degrees F. Grease and flour bottom and sides of a 13 x 9-inch baking pan. 2. In a small sauce pan or in the microwave, melt the butter. 3. In a large bowl, using a spoon, stir dry cake mix, sour cream, butter, vanilla and eggs until well blended. 4. Remove and set aside 1 cup of batter. Spread remaining batter in pan. Spread pie filling over batter in pan. Spoon remaining batter on top of pie filling. 5. Bake for 25 to 30 minutes or until a toothpick inserted into the center of coffee cake comes out clean. Remove from oven and place on a wire rack to cool. 6. Prepare powdered sugar glaze. Combine powdered sugar, water and vanilla extract. Stir well until blended. Drizzle over warm coffee cake. Serve warm or at room temperature.